The Alpine Christmas Wreaths look a lot like our signature Cascade Wreath. Our elves add red berries for an extra touch of Christmas color to this fresh wreath. 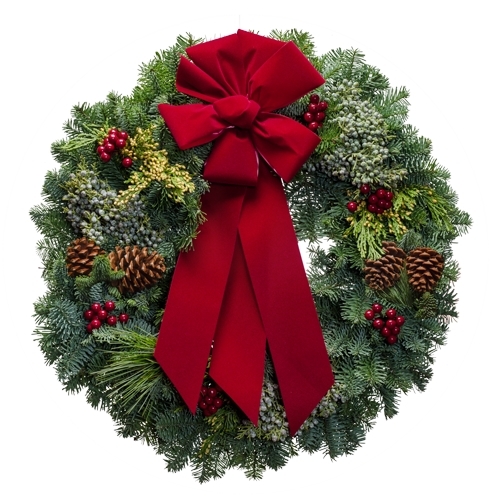 Enjoy the aroma of beautiful Christmas wreaths from the forests of the Pacific Northwest. Everyone who sees one of these live wreaths on your door will love the pastel blue juniper berries and pale yellow incense buds from the Oregon desert. It's very special and we know it will add pizzazz to your Christmas front door this year. "The Alpine Christmas Wreath arrived this afternoon and it is even more beautiful in person than pictured! Oh, and it smells amazing!"